Home › Electronics › M.Way Universal 4 In 1 Clip-On Cell Phone Lens Kit Fisheye + Wide Angle + 8X ..
M.Way Universal 4 In 1 Clip-On Cell Phone Lens Kit Fisheye + Wide Angle + 8X ..
Universal lens clip: The lens included in this set can be used with a wide range of cell phones and mobile devices including iPhone 6S, 6S Plus, 6,6 Plus,5, 5C, 5S, 4, 4s; Samsung Galaxy S6, S4, S3; iPad 2, 3, 4, Air, pro and many more. Velvet carrying bag included: Keep lenses clean and safe - store them in the velvet bag provided. Features: 1.Perfect for long-range photo taking with a 8 x magnificationcamera lens. 2.Portable and durable, you can take photo with your devices atany time any where. 3.Plug and play, easy to install. 4.Make your short-sighted camera/phone into a telephoto. 5.The mount holder clip fits cell phonewithin 36-45mm width. 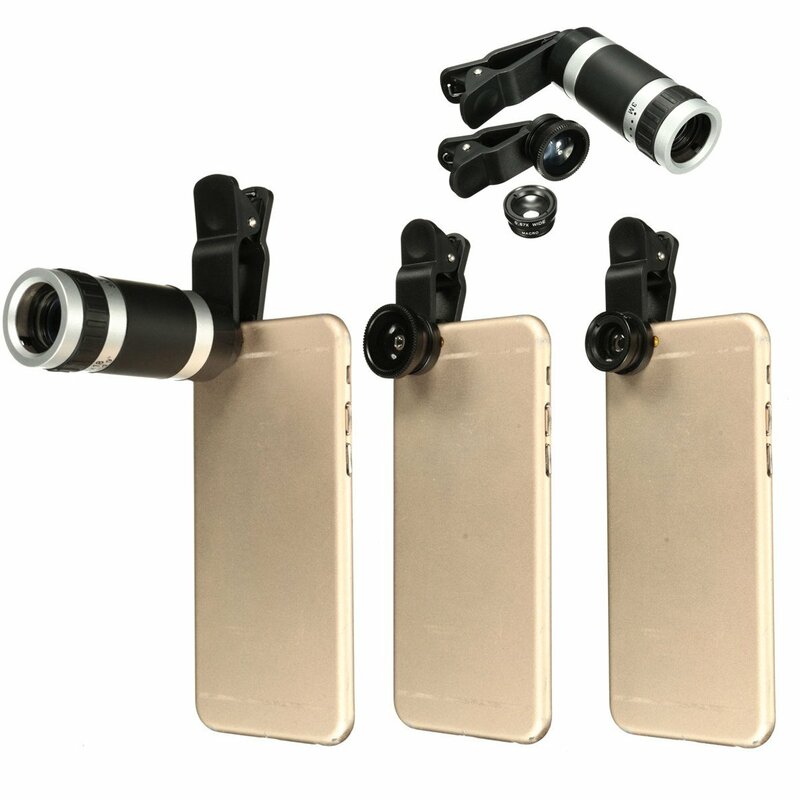 Specifications: 1.Color: Black+Silver 2.Material:Plastic + Metal + Glass 3.Magnification: 8X 4. Field of vision: 9 degree 5.Product size: 78x 30x 30mm Usage: 1.Extend the metallic flexible handle, thenput in mobile phone. 2.Move focusing holder right or left to adjust the lensÂ¡Â¯center of camera mobile phone. 3.Set the end with screw of long focal lensinto lens adapter of universal holder, then rotate and lock. Package Included:1x Telescope 2x Camera lens 2x Clips 4x Caps 1x Pouch Note: If you canÂ¡Â¯t getintact image, you should move the movable focusing holder right or left, oradjust the universal holder up or down until getting intact and clear image.